Handmade clay brick pavers don’t seem to be popular anymore, and until a close match can be found, the backyard job is on hold. For at least a week anyway. 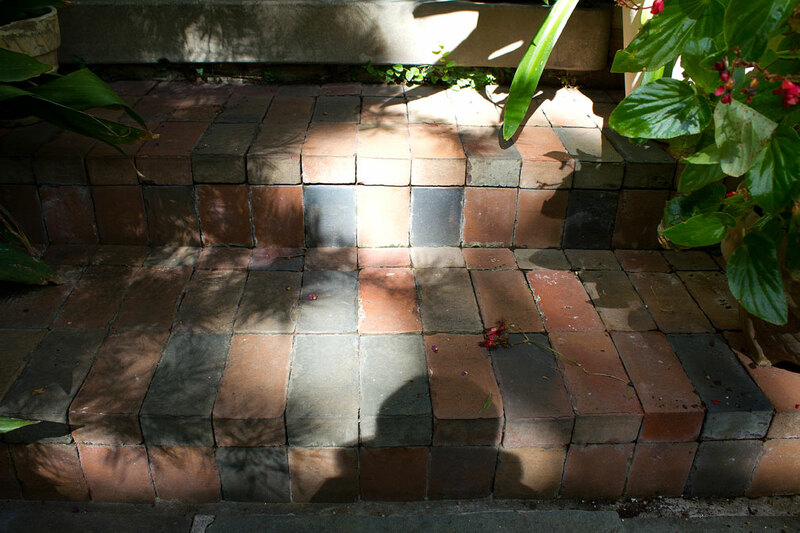 The pavers on my front steps that you see in the above photo were installed seven years ago, and I failed to make a note of their name and color at that time. Ideally, the pavers for the new back steps and extended paths should match what I already have. Since they aren’t stocking many paver choices, the dealer has been kind enough to offer to walk their Denton yard to see if he can come up with enough pavers to match from the overage pallets left over from previous years. Tomorrow, Thursday, the lace fence fabric will be delivered sometime between one and five, and once it’s physically here, I will ask Hadden Landscaping to schedule the fence’s installation. I don’t expect this to happen this week. Knowing my luck, the fence and pavers will be installed at the same time on the same day causing mass confusion. Oh, Patsy Ann, you WERE wicked not to make note. How fortunate that you have someone willing to do a scan for partial pallets of pavers. Luckily, if there is a slight difference, it will be in yards separated by a house. I can’t wait to see the fence! Margaret, not wicked, more like super dumb. When it comes to the inside restoration work, I have copious detailed notes on everything done digitally and in notebooks. I should sign up for a cloud backup pronto just in case a firebomb hits my home. One can never have too many backup options.